The internationally acclaimed Third Coast Percussion quartet assumed the position of ensemble-in-residence at the University of Notre Dame, beginning in June and continuing through the next five academic years. The Chicago-based ensemble, consisting of Sean Connors, Robert Dillon, Peter Martin and David Skidmore, will perform on campus, engage in interdisciplinary collaborations across a wide range of disciplines, perform world premieres of new works by leading composers, conduct master classes and provide community-building residency performances and activities for youth in local schools. Third Coast premiered the piece “Resounding Earth” by world-renowned composer Augusta Read Thomas on Sept. 30, 2012, at Notre Dame’s DeBartolo Performing Arts Center. The piece was the result of a year-and-a-half investment in the composition on behalf of the University, the composer and the ensemble, and the piece was met with an energetic response by the audience. “Resounding Earth” is a 28-minute work for a percussion quartet featuring more than 125 bells from a wide variety of cultures and historical periods. 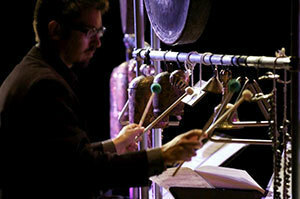 “Resounding Earth” was commissioned by the DeBartolo Performing Arts Center, with additional funding from the Virginia Commonwealth University School of the Arts, Department of Music and the Chamber Music America Classical Commissioning Program, with generous funding provided by The Andrew W. Mellon Foundation and the Chamber Music America Endowment Fund. In addition to performances on tour around the country, Third Coast Percussion’s hometown presence includes an annual Chicago series, with four to five concerts in locations around the city. The ensemble has collaborated in concert with acclaimed ensembles Eighth Blackbird, Signal and the Garth Newel Piano Quartet; pianists Amy Briggs and Lisa Moore; cellists Nicholas Photinos and Tobias Werner; flutist Tim Munro; vocalist Ted Hearne; and video artists Luftwerk. Third Coast’s passion for community outreach includes a wide range of residency offerings while on tour, in addition to a long-term residency with the Davis Square Park Community Band on Chicago’s South Side. Founded in 2005 and hailed by the Chicago Reader as “one of the finest new-music ensembles in the country,” Third Coast Percussion presents concerts around the country for all audiences, from the percussion novice to the contemporary music aficionado. The DeBartolo Performing Arts Center facilitates learning reflective of Notre Dame’s distinctive liberal arts tradition through the informed exploration of universal truths and beauty. The center serves to encourage and celebrate the human spirit through the performing and cinematic arts that connect, stimulate and enrich its communities. Originally published by Notre Dame News at news.nd.edu on July 22, 2013.